Presenting our arcade style game for the Palm Pre and Palm Pixi – Lunar Attack 1.1.4. You are part of a global mission to colonize the moon by building base stations. You have been assigned to protect these bases at any cost by controlling the computer system to launch laser guided bombs (LGBs) into space to destroy meteors and debris that may cause damage to the bases. However, there is a group called the “Lunar Anti-Colonization Army” (LACA) that have infiltrated the lunar colony and have vowed to sabotage the construction and terrorize the workers. Be on the lookout for any LACA saboteurs. 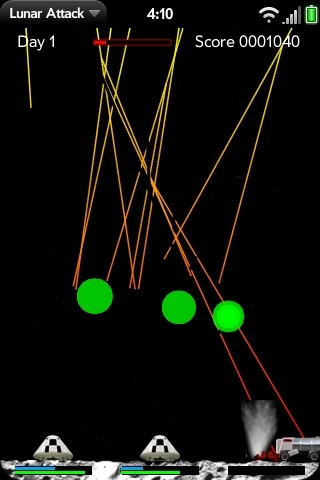 The screen capture below shows the meteors falling to the lunar surface and exploding from the LGBs controlled by the player. You can set the difficulty setting in preference. With a novice setting, you will start with 3 bases. With a pro setting, you will start with 2 bases and with guru, you will start with no bases. After the end of each day, you must land a base on the surface without crashing. The screen capture below shows the preference screen where you can change the difficulty level. The screen capture below shows the player landing a base. Read the tips and tricks section for pointers on how to land properly. Land where the status indicators are on. The image on the left shows a close-up of where you should land your base. The blue status bar on the surface shows the amount of fuel left during this time. To control your base, flick your finger in the direction you would like the base to travel. Flicking faster will increase the thrust to the rocket power. Once you land, the base has a finite amount of LGBs and shield power. To protect the bases from meteors, launch a LGB into space by touching the location to target. To turn on your base shield, just touch the base. The shield will remain on for a fixed amount of time, then automatically turn off. Keeping your finger on the base will not keep the shield on. You must re-activate the shield after the shield has turned off. When your base resources get low, a tanker will drive up to your base to refill it. While the tanker is filling your base, you cannot shoot LGBs or turn on your shield. After each day, your bonus score will be tallied and shown. You will get bonus points for each remaining base, and LGBs and shield power left. There is an enhanced radiation weapon (ERW) that can be detonated by flicking quickly upward on the screen. 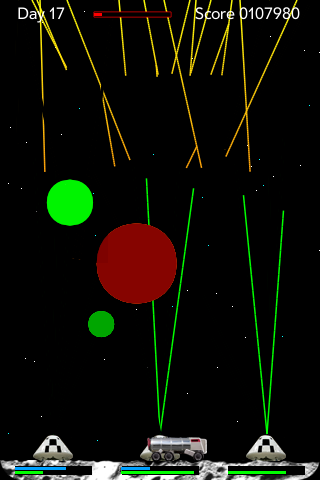 Under normal circumstances, activating the ERW will destroy all meteors and debris on screen. You are awarded more ERWs after the end of each day. The red status bar at the top of the game area shows how much ERWs are left. To increase the chances for the base crew to survive the ERW blast, base shields will automatically be turned on during the ERW blast. This is a demo video of version 1.1.0 which will be released in February. Stay tuned. When landing your base, use big flicks at first, but as you near your landing area, use micro-flicks to control your base more accurately. Do not waste fuel during landing because what fuel is left after landing becomes your remaining shield power energy. Since you are scored on the number of LGBs you have left at the end of each day, do not waste them on meteors that will not actually hit the bases. LGBs explode larger when they are further from the bases. Therefore, it’s easier to hit the meteors while they are far away from the lunar surface. If it appears that your base will be destroyed while being filled by a tanker, touch the tanker to abort the filling process and the tanker will drive away. If you have all 3 bases and you are running low on LGBs, let the base get destroyed near the end of the day so that you will get a brand new base at the start of the new day. Not everything is obvious. Try some actions that you think may work. It just might. Q: When I’m landing my base, I keep crashing. What am I doing wrong? Land on the space where the status indicators are on. If the indicators are blank, that is not the proper place to land. 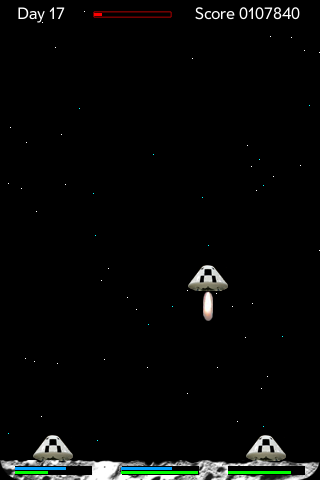 Land softly by flicking your finger upward causing your bottom rockets to thrust you away from the surface. Use micro-flicking movements to adjust your velocity so that you land softly. You must also be traveling vertically and have no movement in the horizontal direction. Keep track of the amount of fuel left for thrusting by looking at the blue status bar where you are landing. When this indicator goes down to zero, you will run our of thrust and crash to the surface. Q: How can I keep the tankers from blowing up? A: Tankers blow up from meteors and the shield from your bases. When you see the message that a tanker is coming out, protect it by destroying meteors with your LGBs. If you do not have any LGBs left, you will have to use your ERWs. However, remember that your ERWs automatically turn on your shields which will blow up your tanker. Therefore, you must time your ERWs so that your tanker is not near a base that has shield power left. A: As of version 1.0.0, your mission will complete after a while and you will be awarded wings. Q: Can I use any name for the leaderboard? A: Yes. But we reserve the right to remove names with profanity, racial slurs or other words that may be objectionable. Q: How do I pause the game? A: Just minimize the game (press the home button) or turn off the phone. Minimizing the game is recommended. When you maximize the game, it will start playing where you left off. If you close the game, when you restart it, you can “continue” the game but you will be starting from the start of the day you were on when you closed the game application. Q: Why is the game running so slow now? A: The game requires a lot of memory to run. Therefore, it is recommended that you close all other non-essential applications running on your Palm. If you find that it still runs slowly after closing all applications, reboot your Palm by pressing the keys ORANGE+SYM+R simultaneously. Reduce stuttering during landing using pitch/roll for WebOS 1.4.1. Added “Check for Updates” in Help. Replace “Loading error” message with “Loading…” for WebOS 1.4. Added app version number to support email subject. Correctly abort server communication and remove error message. Sound effects and vibration added. Control base landing using pitch/roll orientation. Added stars in background during game play. Fixed bug where nuke did not turn on all base shields sometimes. “What’s New” changelog added to App Menu. “Discussion” added to App Menu to allow players to read and/or leave comments on mobigamedepot.com from within game app. Added 3 Leaderboard options for high scores. “All Time” shows top all time high scores. 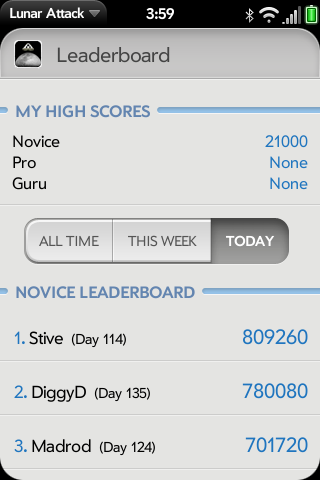 “This Week” shows top scores from last 7 days. “Today” shows top scores from last 24 hours. Please feel free to ask questions about the game in this comment section. I have an iPhone and I really want to play this game. What am I doing wrong?? 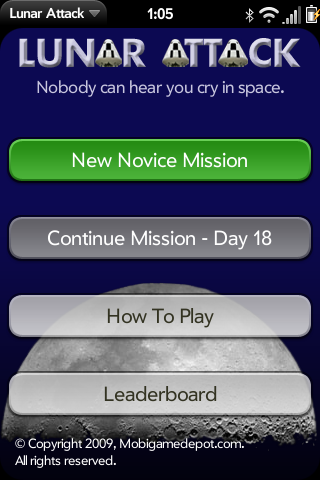 Sorry but Lunar Attack is currently only available on the Palm WebOS platform (e.g. Palm Pre, Palm Pixi). it would be great if you had a change log on here, so we know what&apos;s new in the updates. Is there sound? If so, how do I enable it please? There will be sound in version 1.1.0 which will be released in February as soon as Palm approves the changes. I will post an announcement on this blog when they do. Thanks very much! Looking forward to the sound! Great Game. We will be releasing a new version for WebOS 1.4 this week. Great game, any reason why bomb explosions are smaller near ground level. Could you also make explosions look more like explosions, last maybe a second or 2 longer. Reminds me of the old "missile command" arcade game. I decided to make the explosions smaller near the ground to make it harder since there is very little delay from launch to explosion. This makes it more likely that you will have to use the shield when it gets closer to the base. Making the explosions look better is a great idea. I&apos;ll see what I can do with the limitations right now. Thanks for posting your input here. On April 22, Afraidemu has finally passed the 2 million mark on the Lunar Attack leaderboard. To top it off, Afraidemu did it in Guru level! 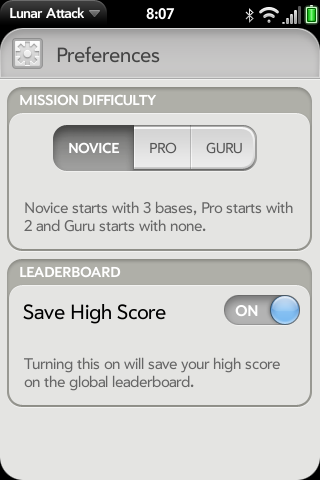 In case you’re not familiar with the difficulty levels, “Guru” is the hardest difficulty mode. On August 6, Player Anasazi has finished Lunar Attack and posted his score of an astonishing 2,673,530 in Guru mode (hardest level) on the leaderboard. Congratulations Anasazi.